Allow me to preface this article with an obvious question you may be asking yourself: Is Pinterest really all that good for traffic? Well, I have 8,350 Facebook fans, 10,200 Twitter followers and 1,550 unique Pinterest followers. Last week, I saw five times more traffic from Pinterest, than from Facebook and Twitter combined. If that doesn’t convince you to listen up, then I don’t know what will. This post is a BS-free zone. I’m not going to leave you snipets of information, or little tips that you can quickly forget, I’m going to provide you with the process I’ve gone through to see the traffic I’m seeing. If you want to master Pinterest, then this is the post for you, so stop making excuses. A little heads up here, this is a long post, and it will take time to take it all in, but this is only part 1 of 2. My advanced strategies will be with you soon (see bottom of post for more details). Imagine a website sort of like Facebook, only instead of people liking a post, they shared it instead. And then their friends shared it too if they liked it, and so on. Can you start to imagine the sort of traffic you might see from this? Ok, so we’ve already established that you need to be on Pinterst, but I’d imagine that most of you already knew this. You were probably like me, knowing that you should be on it, but couldn’t really be bothered to divide your time over another social network (hello Google+), and kind of just hoped that you wouldn’t have to. I’m going to show you exactly what I do to see so much traffic, but first, lets start with the basics. From a marketing point of view, it can be hard to get your head around how pins are counted, and how it converts into traffic, so let me give you a little run down. You post an image to a board, where other people can browse, see what they like, and either like it, or pin it to their own board. This image links back to the webpage that you pinned it from, and most people will click through and read the post. If the image is an infographic, and all the information they need is on Pinterest, then they probably won’t bother so much. Hold a little something back (although Pinterest does make long images very narrow when you click on them). So lets say I pin something to my board, and it gets repinned 10 times. That counts as 10 repins for my pin. If someone takes one of those repins and repins it again, that does not add towards my total number of repins, because it was pinned from another source. Choosing a board at random, I can find a pin with 7 repins. If I have a look at who’s repinned my pin, I can see that the majority of them receive just a couple likes and repins. Except for one. One of them has 26 likes, and 103 repins. And I could go on further, and look at how many times it’s been repinned from there, but I think you get the picture. It can start to spread like wildfire. The point is, just because you can’t see how many repins you’ve received, that doesn’t mean you’re not seeing big traffic. Use Google Analytics to have a better look. This is pretty basic, so I’m going to speed through it, but it’s worth reading. When it comes to choosing a name, I suggest something along the lines either the name of your website, or whatever other name you use in social media. I like to associate myself with my website, so I go for PhotoJosh (which I use as my twitter name), which is good, just don’t call yourself something that doesn’t have anything to do with your website or brand (such as SamSmith). Looking for a bio? You should already have a pretty solid one with your Facebook/Twitter so use that. If you don’t, then just make sure that you use your keywords so that they come up in searches. Connect your Facebook and Twitter too, that will help you to see some more traffic. When it comes to your profile image, use a photo of yourself, not your website logo. It allows people to feel that they’re connecting with a person, rather than a brand. It’s my experience that I find better interactivity this way. Start of with one main board, the one that’s going to be followed more than your others. 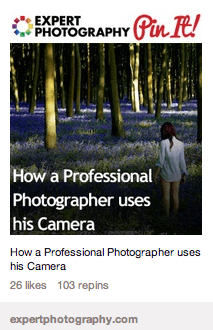 For me, this is ‘Photography Tips, Tricks, & Tutorials‘. This is where you’re going to pin your very best content, with diverse sources, not just yourself. Now it’s time to learn from my first mistake. Pinterest can be a lot of fun (and I say this as a young, heterosexual male), and you might find the urge to pin other interests that you may have, which for me were male fashion, food, and architecture. This is a big no no. Rather than people clicking on the ‘follow all’ button, they chose to follow individual boards instead. The problem with this is that when you add new boards, only the people who are following all of your boards will be following your new boards automatically too. Stay within your niche, and keep the titles short. They can all be searched for. To start with, I would suggest building perhaps 4-5 boards to begin with, before we look at more advanced techniques in the next post. Here’s how I started in my photography niche. My main board, where I pin mixture of content, related to photography. A gear board. This links to a bunch of Amazon Associates posts on my website (you can’t earn commission straight through Pinterest any more, it has to link to your own site). 30 Day Photography challenge. This was a niche within my niche, where people could find all the relevant links to a challenge I had set. A group board. This is powerful for finding traffic, and followers. If you look at my boards now, you’ll notice that there’s currently 15, but I will get to the rest of those boards in the next post. This is my first little trick for you to start seeing more followers and traffic. 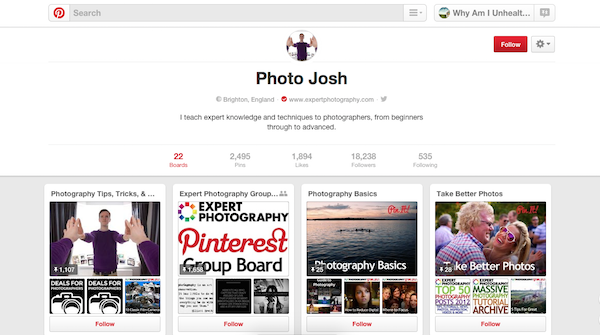 On Pinterest, you can allow multiple people to pin to a board at once, so why not allow your fans to pin with you? Create a board, invite all of your fans and followers to come and pin with you. You have to follow them to add them to the board, but that’s fine, and you’ll undoubtedly get a follow in return. Then you have a board that gets lots of followers, and all the pinning is done for you. You can occasionally take links and pin them to your other boards, and promote your own stuff there too. It’s easy to do, a great way to find followers, and in my experience, the great content that gets pinned on there sees a lot of repins too. Check mine out. Ok, time to bare with me as we have a look at the house rules of Pinterest, or rather, the etiquette. This is hugely important, because you don’t want to scare off potential followers. You don’t want to stand out as a bad pinner, and it’s really not hard to use Pinterest effectively, so adhere to the following rules. Don’t solely pin yourself. Ease off the constant self promotion (spam? ), and try to pin 50/50 on your main board, of your content, and someone else’s. Your followers will appreciate this, and you’ll actually see more of them. Credit your sources. This means don’t take a nice looking infographic, host it on your website, link back to the source (on your webpage), but pin your webpage. This isn’t playing fair, and people actually want to see the source. Pin to the correct board. Don’t go posting graphic design on a photography board. Similar? Yes. Right place for the pin? No. Write a description. Sometimes the image doesn’t tell us much, and a few words will help people to click on those links! Don’t go too mad with the pinning all at once. If you’re brand new, then this is fine, but you don’t want to spam followers. I pin 1-5 times a day at the moment. When you see something you like, like it. As I’m sure you’ve worked out by now, Pinterest is very image heavy. You may think that you don’t really work with images, so it’s not relevant to you, but it is. Even if it’s just an image of some fancy text, including your post title, that’s enough to get pinning. But how can you best use images to your advantage? There’s a few things you need to remember. Firstly, when we talk about visual weight in photography (as in, what do we look at first and longest), writing come pretty high in the rankings, because we’re so used to looking at it. Add text to all of your images to let your followers know what they’re about. You will also notice that on Pinterest, there is a maximum width for images, but no apparent maximum length. This means that you can add some serious Pinterest real estate by making long images, and pinning those. Check out the image to the right that I used. Rather than pinning a single image, I took five minutes, added all of the photos to a single image, and pinned that instead. Trust me, this works wayyy better. You will also want to consider watermarking your images. Perhaps with your website URL or your Pinterest name; it’s a good idea to brand your images. Your description is important too, even if you have your text on the image. People can search for pins and you want your pins to show up in the results too. Cover all of your bases. If you’re marketing products on Pinterest, then it’s a great idea to include a price in your description. Why? Not only is this important for your description, but Pinterest will very kindly add a price banner on pin for you, so everyone can easily see how much an item costs. If you post only your own content, then people are going to see this as advertising. If you post a wide variety of content, from the best on the internet, you’re going to find a lot more followers, because people see that you hold the board to a high standard. You can then include your own content, and more people are going to see it. I’m going to start with the obvious here, as it’s all too often ignored. Promote your page through your other social media accounts. Post on Twitter, Facebook, and Google+ and let people know that you want to see their boards, while telling them about yours at the same time. Promoting a social account is not too dissimilar to promoting a website. Cool, now that’s out of the way, lets look at Pinterest specific ways of promoting yourself. This is similar to Twitter marketing if you’re familiar with that. Firstly, make sure you have at least two boards made, and then you want to go looking for other people posting similar content to you. Use the search bar, and type in your niche (for me, it was photography tutorials). Then in the top left-hand corner of the page, you will see the option to choose between pins, boards, and people. Choose boards. Without even clicking on the boards, I can see nine of my tutorials pinned to three of the first 10 boards. Perhaps I’m doing something right here? Start by following up to about 100 of these boards straight away. This will get you noticed, but there’s more that you can do. Go back to all of these boards, and like 3-5 of their posts. Quickly browse for what looks like the best content, and click like. I do this with all the boards that I follow, because you take up lots of room in their notifications, so they’re more likely to check out your profile. Finding your first set of followers is really important, so don’t skip this step. For example, if I click on the very first board that pops up, they’ve pinned 36 of my posts, and those pins have had a total of 498 repins. From one board. You should be using some sort of social sharing plugin on your WordPress site, and I strongly recommend that you add the Pinterest button. The majority of Pinterest users will have a browser plugin or bookmark, but this does help to remind them. It’s also a nice way to see a count. I also use a plugin called Pinterest Pin It Button For Images which isn’t the most popular Pinterest plugin, but I think I’ve probably tried them all by now, and this is my favorite for images. When you install it, you need to input the maximum width for your images in the settings, but after that you’re ready to go. The reason I like this plugin is because the ‘Pin it’ button appears above every image in your post (except featured image), and then when you highlight the button, the image brightens, which makes it stand out. Very useful. It also skips the step that a lot of these plugins make you go through. When you click on the button, you don’t then have to choose an image, and it will also take your title text as the description. Perfect. Always post your featured image at the bottom of the page too, to remind people to pin the post. Another plugin you might like to consider when starting out, is called Pinterest RSS Widget and it will take your latest posts and display them anywhere on your website, in a size that you specify. I used to have mine set up in my footer because it would show people that I was on Pinterest, and allow them to follow me. I’ve found a good standing on Pinterest now so I don’t really need it taking up more page space (but I would recommend it for you). So you should have your website optimized, as well as your other social networks. Whenever you post something to your main board, click on ‘Post to Twitter’ too, because this will tweet the pin, rather than the link. This goes against what a lot of Pinterest marketers will tell you, but I have my reasons. Firstly, most people don’t comment. Secondly, have you seen the notification system? It’s pretty poor, you can’t look at all of them, so when people comment on my pins, I tend to miss them. I’m not looking for comments, I’m looking for repins and likes. If I want to give someone a nod for a good post, or to thank them for pinning my content, I like their pin. You need to get setup with an analytic service like Pinfluencer, as they have a 60 day free trial, and you can use that time to track your pins, see who follows you, who’s the most influential, which are your most popular pins, what your competitors are doing, and much more. Like Google Analytics, you can only track your progress after you set this up, you can’t look into the past, so the sooner you get started, the better. I will see you in part 2, where I show you how I converted my Pinterest boards into a mini version of my own website, and I start to see the best traffic I’ve seen in a very long time. I have never been to any post like this before, it’s huge! It took so many minutes to complete the full article. The more I’m reading about pinterest the more I’m getting excited to use it. Last time I heard people making money out of it and now here I have told that it brings massive traffic. I’m going to now follow this. Let’s see how it works in my case. Thanks, I got about half way through writing it became very clear that I would need to split the information over two posts. Thanks for the great post…can’t wait to get started. Awesome post, Josh! Thank you for the plugin recommendations. 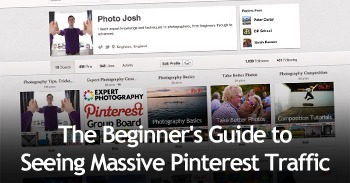 I have been using pinterest minimally & I’ve already seen better traffic results than Twitter. Your tips will help me build on that! Amazing post… can’t wait for part 2..
Group board was completely new for me. .
Hope I can apply these techs.. to increase traffic to my website. Thanks again for this amazingly insightful post. Long time indeed, good luck with your Pinterest! Thank you for sharing. I’m heading over to Pinterest to get my boards in order and properly implement it. Thank you for your tips on Pinterest. I recently created my account and I was looking after tips for Pinterest. I will try what you’re suggesting. I’m looking forward to the part 2! Have a wonderful day. I believe that Pinterest traffic depends on the niche and level of followers you have. You need to have someone pin your work first to get major followers. It’s the snowball effect. You start off very small, and very slow, but then it really starts to take off. 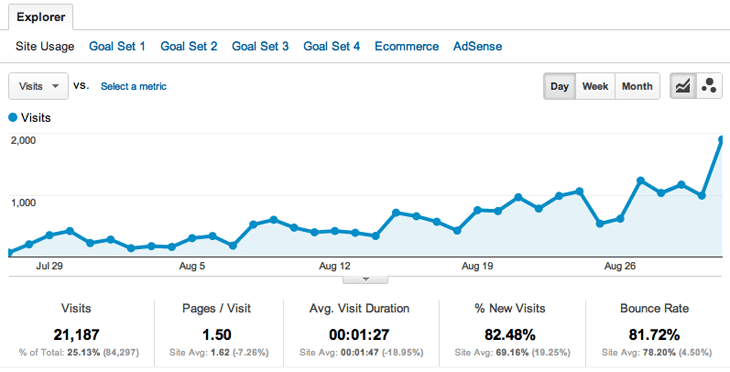 What you don’t see from my traffic screenshot is that there was a couple months of really poor traffic before it. Its the same with social bookmarking, it’s great if people are bookmarking your site as well as yourself, but to much bookmarking of your own pages without helping someone else out provides negative results. If you have great content, when you start pinning people are going to repin your content. Yes, on your main board, pin other people too. It does take work, but now that I’ve got the ball rolling, I can sit back and visit the site a couple times a day. Pinterest is a great business tool, I also love it as it provides me with inspiration as well as an aesthetically pleasing place to look at pretty images and day dream away in some instances! It can be tough to get started but once you do get some followers oh boy it pays off. Very helpful! I have an account on Pinterest but really haven’t dedicated much time, mostly because it is a little overwhelming at first. I do worry and wonder if my niche will translate as well to Pinterest though. The images I use on my blog are just basic stills and not overly riveting. But I definitely want to find a way to utilize this platform, as I need more traffic. Overlay text onto your images, and you will start to be more relevant. Never thought of using Pinterest in a truly business way. This was great insight on how to pick up my game. Thanks and looking forward to Part 2! Thanks for this, I am an artist and I love pinterest. Been looking for some ways to increase followers and traffic. I guess I need to start taking Pinterest seriously. I signed up for an account, but have not used it in any business related ways yet. Definitely going to look into it more now! Thanks! Great post, exactly what i was looking for! I was about to get started on Pinterest and this info. came at the right time indeed. Great info to help a newbie get started! Social media are always played an important role for every blogger and now Pintrest is just a boon for every blogger. We can use pintrest wisely to get huge traffic. Thanks author such a great tips and tutorial. Great article. I am still trying to figure out Pinterest. I would like to know how to invite friends to pin on my group board. I connected my account with gmail and facebook and no one is listed. Also how did you create long pictures like that? Photoshop, but your can use GIMP. Excellent value in this article. I am really beginning to see the potential with Pinterest. I am excited about seeing part 2! Thanks for the awesome info on using pinterest. It is moving fast among marketers and I felt like I was falling behind because I never spent that much time there. Josh, thanks for a great post. I have really underestimated the value of Pinterest for my blog but I think I should really take a look at it. It seems to be growing rapidly…. Thanks for the great Pinterest tips! I just joined a couple months ago and am still trying to learn the ropes. Thanks for the Pinterest tips! Be sure to keep focused on your tasks at hand. I’m new to the site and these are tips I haven’t heard before. I will definitely try following related boards, liking pins and making a group board. Looking forward to part 2. Awesome tips, will try to set up a pinterist account using this guide. Thanks! I’ve been on Pinterest for a few months & haven’t come across this problem before. After following 2 pinners I wanted to go look at random pins, I pushed the “house” button ( bottom far left) and the only thing that showed up was the pins I pinned earlier in the day. No matter what I’ve tried nothing has worked. Can someone help me. So I can start pinning again. I read your valued information a few weeks ago and put it into practice, adding likes and boards to follow on a regular basis. It works just like you said as there is a noticeable jump in my website traffic. I look forward to part 2. Thanks for the great advice! I especially agree with your practice of not commenting on pins – it often feels forced when brands try to connect with people this way since it’s not a common practice on Pinterest. Great post! Especially the Group Board concept – so astute. Let’s see Part 2! Thank you! This was great. Ready for part 2! Great post! Cant wait for part 2.